No wonder that for centuries, poets immortalised the magic of springtime. There are so many new wonders to behold each day. Only six weeks ago I posted about the garden in winter and now, new life is burgeoning. 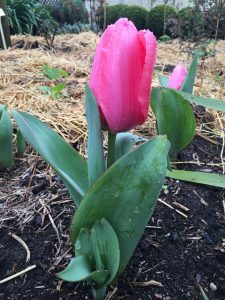 For instance – this glorious pink tulip “Pink Impressions” – I have a group of them just emerging in the Rose Garden. Best thing is that apparently they don’t have to be lifted and can remain in place for many years – so we will see. As we enjoy the last day of winter, it’s satisfying to note that the big jobs have been completed. Fertilising the whole garden has been done and trees pruned, including the orchard. We had a big load of rectangular pea straw bales delivered from Tumby Bay. Despite strong wind, barrow loads of straw were then used to mulch the orchard, while the ground was still damp. Now, bit by bit, the rest of the garden will be done. It’s a job I greatly enjoy because it gives me the opportunity to see – up close – the emerging growth in the garden. Roses are all showing new foliage and a new one planted this year “Lucina” even has a bud about to open. I’m hoping the parrots don’t decimate the shoots as they did last year! We used all manner of bird scarers – some to no avail. This year, I’ve added some special highlights in the Rose Garden – glorious delphiniums. There are three in each of the four beds, all in shades of blue except for “Sweethearts” which are pink. So much to look forward to – yet another reason to ensure that spring is enjoyed. First thing in the morning, a quick walk around to view all the new wonders is mandatory. This is a very special time, before the heat of late spring and summer commences, so I make sure not to miss any of the ephemeral joys of the season.